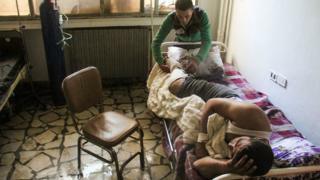 Russia has tried to deflect blame for a deadly chemical attack away from the Syrian government, the US has said. White House officials told reporters that intelligence reports confirmed that Syria was responsible for the incident, which killed 89 people. Syria has denied it and Moscow has instead blamed rebel forces. The US fired 59 cruise missiles at a Syrian airbase in retaliation, but the global community is divided over how to respond. On Tuesday, senior White House officials discussed a four-page declassified report that says Syria and Russia have used "false narratives" to try to confuse the international community. "Russia's allegations fit with a pattern of deflecting blame from the [Syrian] regime and attempting to undermine the credibility of its opponents," said an official. The report said the government of President Bashar al-Assad carried out an air strike on 4 April in Idlib province to hit rebels in the area. A chemical agent was flown by aircraft that departed from the Shayrat airfield, the document said. "I think it's clear that the Russians are trying to cover up what happened there," one of the officials said. But they refused to comment on whether Russia colluded with Syria on the attack or knew about it in advance, a point echoed later by the US secretary of defence. James Mattis added: "There is no doubt the Syrian regime is responsible for the decision to attack and for the attack itself." His comments came just after US Secretary of State Rex Tillerson arrived in Russia to challenge the Kremlin over its support for Mr Assad. A two-day summit of G7 ministers in Italy ended in division over Syria, as the UK proposed - without success - sanctions against Syrian and Russian military figures over the chemical attack.